What a gross editorial minimizing of the significance of Obama demanding internet media programs must provide a gateway for government access and monitoring. What happened to the editorial diatribes about first amendment rights and the thrashing of the constitution when Bush utilized the Patriot Act for telephone surveillance of foreign terrorists calling into the US? Roanoke Times, 9-27-10, Pg 1 & 14: Road money, VDOT’s audit turned up a pot, but not enough to carry Virginia into the future. Found money is the most fun to spend. What a sugar-coated view of this situation that was meant to cover-up the malfeasance of two Democrat administrations and the hundreds of square feet of Roanoke Times print lamenting and bashing the Republicans for not wanting to raise additional taxes for VDOT projects. The Roanoke Times Editors didn’t even have the intellectual honestly to print the amount (almost $1 billion) that was found by audits initiated by Republican Gov. McDonnell; instead they labeled it a “potful”. These are yet more examples of the published intellectual bias and slant of the Roanoke Times Editors that disqualifies them as a valid newspaper organization and relegates them to yet another of the Democrat party’s media outlets. Roanoke Times, 9-27-10, Pg 3: Taxes: Democrats confident of tax vote after elections. Lead us not into temptation, we can find it all by our selves! Pelosi, the wicked witch of the West (San Francisco) led the naïve newly elected pseudo-bluedogs into the swamps of massive deficits, debt and taxes with her “siren song” of socialistic populism. With dark clouds now gathering over the reelections of her Congressional Minions, the witch is now faced with a rebellion against her plan for a vote on massive tax increases during this prolonged jobless recession. Many of these Democrats are now hiding from their voting record of Cap&Tax, ObamaCare, Bailouts, TakeOvers and the Nonjob-generating trillion dollar stimulus of money we don’t have and can’t pay back. The Democrat election strategy has now been reduced to its lowest common denominator “class warfare”. Let’s Tax and denigrate those nasty rich people! Down with those who have rightfully achieved financial success within the American free enterprise system. After all, the top 5% are only paying 60% of the taxes. Let’s stoke the fires of class warfare with the 50% of the people who pay no net income taxes at all. This is not a new approach, the text book on this strategy was “Das Kapital” written by Karl Mark in 1906. The bad news for America is that these people have massive amounts of campaign money and spin-doctors to saturate their friendly media in order to white-wash their voting records. Hopefully the voters will see through the facade and vote them out on Nov 2nd. Roanoke Times, 9-26-10, Pg 9: White House says case involves state secrets. Obama has declared to the courts and the world that he has the sole and independent and unchallengeable right to target and kill American citizens throughout the world; and the Democrats, Liberals, Progressives, ACLU and their media minions stand totally mute! The Roanoke Times demonstrates through their editorial silence the stark hypocrisy between the liberal-progressive media coverage of Bush vs. Obama. Where is the indignant and sanctimonious outrage? Where are the threats of impeachment? Where are the lists of violations of the Constitution and due process and habeas corpus being committed by Obama? The Roanoke Times this week filled their paper with heartfelt sympathy and regret and apologies for the State execution of a woman convicted of the murder of her husband and stepson for money, yet these summary executions by Obama, without trial or due process, results in “the sound of silence.” What a pathetic example of politically motivated standards of justice and morality. Iran's Ahmadinejad (ImAnutJob) began his speech at the UN this week with a full-throated assault against capitalism. Apparently ImAnutJob and Obama agree that capitalism and America’s free enterprise system are bad. Unfortunately for us Obama has been working diligently to diminish and marginalize the systems that have made this a great country. Obama is clearly an academic-socialist without any shame or remorse or apology for his policies of further degrading the American free enterprise system at the expense of real-jobs, real-growth and business development. He has squandered over a trillion dollars of future tax dollars propping up his political constituents without regard for what makes our businesses and enterprises work. How could he know? He’s never had any involvement in business or industry and neither have most of his bureaucratic team members. Who among them have been a captain of industry and creator of good private industry jobs? All Obama’s major initiatives are job killers including: card-check, higher taxes on successful and entrepreneurial people, Cap&Tax, extension of EPA job-killing initiatives, ObamaCare and curtailing sources of domestic energy. In addition, he has filled the government regulatory agencies and judiciary with people who are blatantly hostile to industry and our free enterprise system. The sooner the Obama, Pelosi, Reid programs of the Obamanation of American is ended the sooner we can get back on the path to economic success. Obama’s Economic Mission Accomplished occurred before the Trillion Dollar NonJob-Stimulus was enacted (exactly how dull was that move?). Now, after doing immense financial damage, Obama’s economic team (high on schooling, low on doing) are leaving like rats off a sinking old freighter. “Twelve months in office with very limited positive accomplishments certainly didn’t stop our Aloft Arrogant Professor Obama from getting up in front of his lowly ignorant students and giving yet another lecture about the joys of socialism, big government, big taxes and big debt. A summary of the varied wildlife that lives in the Arctic region and the author’s assessment of the impact a reduction in Artic ice cover may have on their survival. Includes a large graphic showing yet another forlorn polar bear and a dire warning to Americans to change their ways. Our 250 years of natural global warming has indeed had impacts on the environment as have the many thermal cycles the earth has experienced over the millennium. During a major past cooling period, the brown bears that moved north found marine mammals to be a good source of food. Over time the lighter haired bears survived best resulting in the polar bears we have today. What a change, and without any input from mankind! Sixteen thousand years ago the Atlantic Ocean was 400 feet lower than it is today. The North Carolina Outer Banks were 50 miles east out at the continental shelf. Talk about your melting ice raising the sea level! And all without any input from mankind! 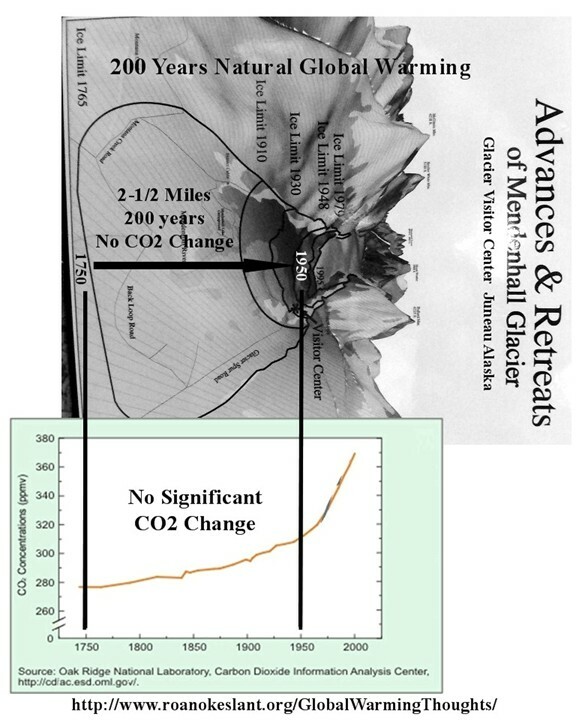 From 1750 to 1950 the Mendenhall Glacier retreated (melted) from close to downtown Juneau Alaska up the valley two and a half miles (2-1/2 mi) with no significant change in CO2 or any input from mankind! The Artic has been relatively free of summer ice in the past and it appears that will happen again. Just 3,000 years ago Greenland was 3 degrees C warmer than it is now. Clearly the satellite images from that period would have show the Northwest Passage far different than it is today! Isn’t it way past due to stop the Gore-Hysteria and fear mongering and report the climate history in its historical perspective? The climate is changing! The climate has always been changing, and without any input from mankind! Last week Russian fighter planes “buzzed” an American military ship in the Northwest Passage. Russia, Norway, America and Canada are claiming the Artic region as part of their territory. The real interesting Artic story is the coming war for oil and gas that lies below the diminishing Artic ice. Not found in the Roanoke Times; apparently coverage would displease their benefactors. One would think the Roanoke Times and their liberal-progressive “first amendment loving” associates would have made this a front page story! I’m sure they would have had it been an anti-Christian item. Kowtow Definition: To kneel in expression of deep respect, worship, or submission. BERLIN –Sept 8, 2010: German Chancellor Angela Merkel praised the bravery of a Danish cartoonist who caricatured the Prophet Muhammad at an award ceremony honoring his achievements for freedom of speech. While Chancellor Merkel stands tall before the Muslim thugs and intimidators of all who cross their paths, our Virtual-Muslim President kisses up to those who harbor and support those who have declared Jihad against us including the King of the country from which 19 of the 9-11 terrorists originated. 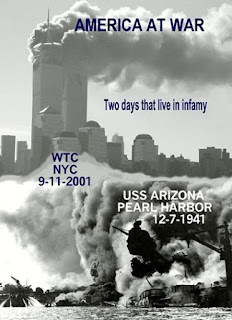 Obama’s 9-11 speech at the Pentagon was yet more “let’s forgive and forget” pabulum. 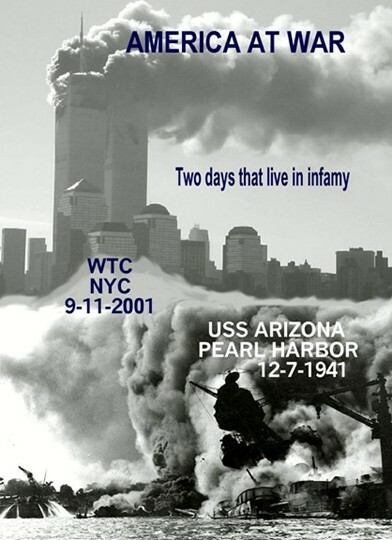 We will never forget 9-11 just as we never forgot Pearl Harbor and the Jews will never forget the Holocaust. Everyone was touched by 9-11 in some way. We have two friends who lost their young sons at the WTC. One was an accountant, there that morning for a job interview. The other a fireman following in his fathers footsteps. Life goes on and some people are fickle and sadly there is now a form of political correctness (fostered by Obama and associates) that wishes for us to forgive and forget while the war still rages on and our soldiers are giving their all for us. How pathetic! What a sad period in American history! Many people of good will are pleading with Rev. Jones to not burn any Qurans. Apparently the mass media hype and notoriety have overcome the judgment of what should be a reasonable and prudent Christian person. It’s interesting that the past burning of Bibles has not caused a front page media stir no less an avalanche of public notice and notoriety including statements by the Commander of our troops and the Sec. of State. Why is that? After all, these people have already declared war (Jihad) against us and are killing our people as best they can. Even our politically correct (PC) history books are afraid to tell students that the Saracens that were confronted by Charlemagne were Muslims. Several high school students in Eritrea were locked up earlier this month ( Aug 2008 ) in metal shipping containers as punishment for protesting the burning of hundreds of Bibles.The students had objected when military authorities at Sawa Defense Training Center near Eritrea’s border with Sudan began burning more than 1,500 Bibles that were confiscated from new students enrolled in the upcoming academic year on Aug. 5, a source told the persecution watchdog agency Compass Direct News. Messianic Jews in Israel say they want an inquiry into the burning of hundreds of copies of the New Testament by Orthodox Jews in Or Yehuda last week ( May 2008 ). Based on the articles and editorials in The Roanoke Times it appears that burning bibles and marginalizing Christian icons does not disturb the sensibilities of the Editors and their liberal-progressive media associates. Apparently placating our Virtual-Muslim President and appeasing the Muslims he is bowing to is far more important that having a fair and balanced view and coverage of Christian religious transgressions. In fact the Editors publicly mock the concept of “Christ in Christmas” at every opportunity including their recent 9-3-10 editorial. Roanoke Times, 9-7-10, Pg 1& 12: Obama proposes another stimulus to a union rally in Milwaukee. The focus: roads, rails and runways (planes, trains & automobiles). Republicans Response: What happened to the last NOT-shovel-ready jobs and how are we going to pay for all this debt and borrowing? 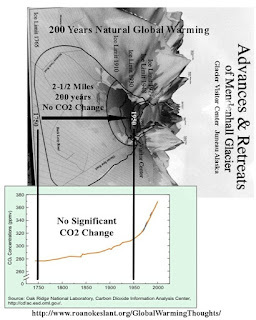 The Sierra Club Response: What about the CO2 and global warming? Yet another Obama payoff to his union friends and supporters with your future tax-dollars, without remorse or apologies for the financial disaster he has enacted and propagated. Obama and his economically-challenged team members have squandered a major opportunity to put the American free enterprise system back on the road to private sector growth and job creation. Instead they have focused on paying back their political constituents and driving the country toward socialism and fascism. Definition: Fascism: an authoritarian hierarchical government that historically focuses on government-run industry and minimization of profit-driven competitive systems. Roanoke Times, 8-30-10, Pg 12: Editorial: An environmental throwdown; Blacksburg and Roanoke face off in the Green Community Challenge. A spirited description of friendly competition between cities for improving the environment, reducing waste and encouraging sustainable actions. Why is the Roanoke Times in the bleachers when they should be “on the field”. The Roanoke Times has a massive carbon footprint that stretches from the woodlands, through the power-plants all the way through their factory to the customers to the landfill. What is their problem? Why aren’t they proactively calculating and publishing their carbon footprint data and then stating their plans to improve their performance and then publishing how they’re doing against their plan? Following are Seven Public Documented Challenges to the Roanoke Times over the past four and a half years to put up or shut-up about “going green”. We are all waiting for some responsible action to replace all their hot air that’s adding to Roanoke’s Local Warming. And stop cutting down perfectly good trees to publish your tripe. Didn’t Gore tell you that these trees are important for consumption of CO2 and supplying O2. Roanoke Times, 9-6-10, Pg 3: Obama to propose research tax credits to speed up the recovery. Large picture of Obama with six of his economically-challenged team members. Supporting research is very important. But without a competitive development and manufacturing infrastructure it simply results in products being built in off-shore locations that then benefit from job creation and profits and further development with scant benefit to America. There are few American invented and designed products being manufactured in America because we are not competitive. Obama is clearly an academic-socialist without any shame or remorse or apology for his policies of further degrading the American free enterprise system at the expense of real-jobs, real-growth and business development. All Obama’s major initiatives are job killers including: card-check, higher taxes on successful and entrepreneurial people, Cap&Tax, extension of EPA job-killing initiatives, ObamaCare and curtailing sources of domestic energy. In addition, he has filled the government regulatory agencies and judiciary with people who are blatantly hostile to industry and our free enterprise system. Roanoke Times, 9-1-10, Pg 1 & 16: Front Page: Cuccinelli rebuked on getting information from UVa. Pg 16: Editorial: Judge shoots down Cuccinelli. Small print: The Judge said indeed the AG can investigate fraud, but first he must show some evidence of a crime in the UVA climate witch hunt. Whoa there Cuccinelli – stop your court action to get data from UVa. We liberals wouldn’t want the public to see the basis for Prof Mann to get millions of dollars of taxpayer money to pursue the Gore-Hypothesis and its predetermined-science-outcomes. Forget all that open-government and transparency stuff we constantly throw at folks and issues we oppose – this is different! Whoa there Cuccinelli – stop explaining to the public the impacts of Cap&Tax on utility bills. We liberals are looking forward to government mandated massive increases in the cost of all energy related products and services and the resulting loss in jobs. We will use our liberal-progressive-media to hammer the utilities and manufacturing and service industries as the villains for price increases and direct the public’s attention away from the real cause. After all, somehow, it must be Bush’s fault anyway. Whoa there Cuccinelli – . Stop your lawsuits against the federal government in support of a bipartisan Virginia law that prohibits individuals to be forced by law to buy ObamaCare products. We liberals are pleased that ObamaCare mandates each American business and person to comply with its demands, costs, bureaucracy and enforcement by the IRS. After all, personal responsibility was just a fad and socialism is a much better method of managing and directing the masses. Haven’t you ever read Karl Marx? Roanoke Times, Editorial, 9-3-10, Pg 13: A church-state minefield. Localities shouldn’t take Cuccinelli’s opinion on Christmas displays as a green light. Officials who want to “put the Christ back in Christmas” should hire a lawyer. Whoa there Cuccinelli – We progressive-liberals know this country wasn’t founded by people who placed God above all else. This was a secular country founded by atheists and agnostics. Ignore all those prayers, emblems, icons, crosses and that thing about being “created equal” by a supreme entity. That’s all revisionist history propagated by those evil bible-banging folks in Lynchburg. Whoa there Cuccinelli – Stop demanding that abortion clinics meet the same standards of cleanliness that other outpatient facilities must meet including inspections to ensure medical standards are being met. We liberals don’t worry about abortion facilities meeting medical standards as long as they get the job done.